Categories: Andal, Divine Names, Hanuman. Margazhi is an auspicious month that falls during Dec-Jan in the English calendar. Our scriptures say that spiritual activities performed during this month yields great fruit. 1. Name the Lord who said that he is indeed “Margazhi” among the months. 2. 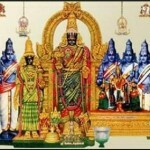 Which Azhwar is worshipped specially during the month of Margazhi? 3. Which part of the day does the Margazhi month signify for the Devas? 4. One year on the Earth is equivalent to how many celestial days for the Devas? 5. What is another name for ‘Margazhi’? 8. In which direction does the Sun starts to move at the end of Margazhi month? 9. Which of the following is specially rendered every morning during the month of Margazhi?